Soaking in a hot bath is a wonderful way to relieve stress. Drop-in bathtubs, as opposed to standing tubs, are placed in the floor, in a platform or between walls. Drop-in tubs are easy to clean, and because the plumbing is concealed, your bathroom will have a cleaner appearance. Check local building codes. This is especially important if you plan to build a wall or make other modifications to your bathroom that require a permit. Measure the area and choose a tub. 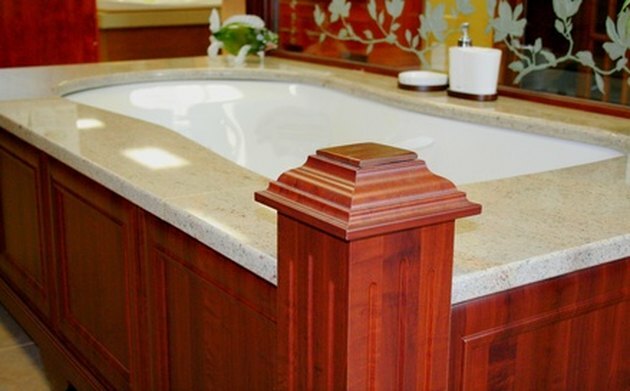 You will need to know the dimensions of your tub in case a new frame needs to be built, or an existing frame needs to be altered. Build a frame or check for an existing frame. If you are replacing a tub, the frame may already be in place. The frame should be the height and width of the bathtub up to the flange (or lip) that will overlap the top of the frame. Place the bathtub in the frame. Check that all edges are level by placing a level on each side of the tub. The floor of the frame should be smooth and level. Mark the holes for plumbing fixtures. While the bathtub is in place (but before securing it), mark where the plumbing fixtures will go. Remove the tub, and drill for plumbing. After the tub has been removed, drill holes for plumbing fixtures. Drill from the finished side of the frame (usually the outside) for the most attractive holes. Install plumbing fixtures. After installation, check that the drain is secure and does not leak before putting the tub in. Lay bedding material. This is the cement or casting plaster that will hold the tub in place. This material can be bought in any home improvement store. Place a piece of plastic over the bedding material. Install the tub. Before the casting plaster or cement has cured, add the tub. Again, check that all edges are level, and make any adjustments needed. Screw the tub to the frame with the mounting blocks found under the lip of most tubs. Finish the frame. The outside of the frame is often tiled to create a cohesive bathroom design. Make sure to leave an access area if you are installing a whirlpool tub (for future repairs). You can finish the frame with any materials that work with your interior design.